Welcome! 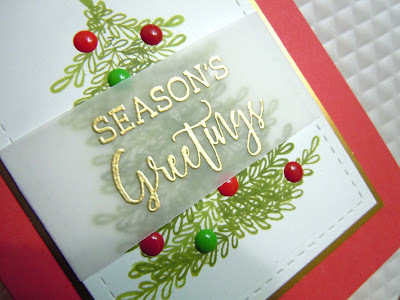 Last year, I did a series on my blog where I asked people to set me a Christmas card challenge. This year, I'm stepping it up a notch, by asking crafty friends to join me! How cool is this graphic!! 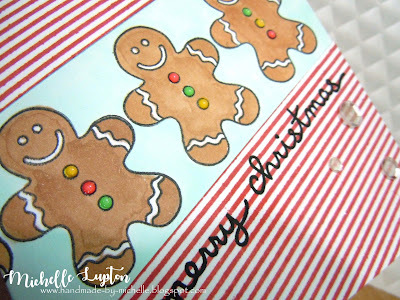 My crafty friend, Kylie Purtell, made it especially for me! YAY! You can check out her blog HERE. 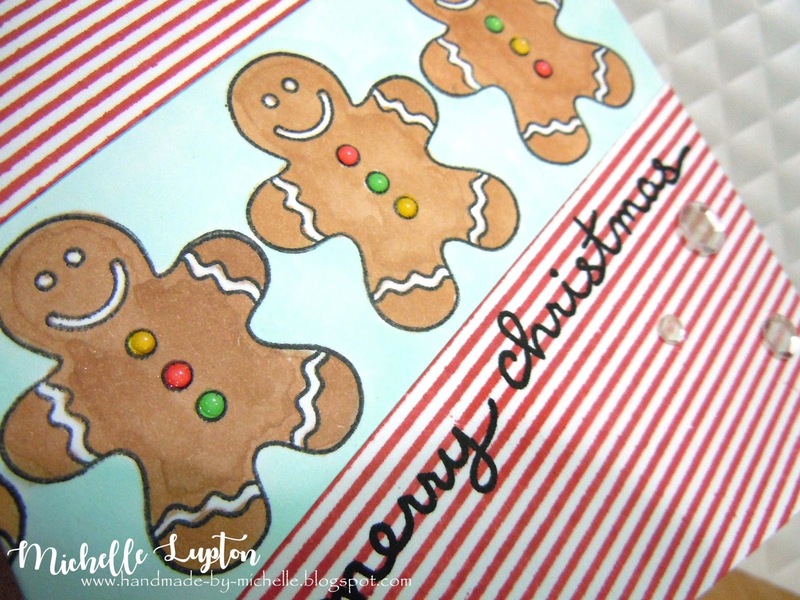 Today, the challenge theme is to join in with the current challenge at Jingle Belles. The current challenge is called "Baby it's GOLD (or SILVER or COPPER) Outside". I do not have a special guest today, but this challenge came from Stephanie Severin, and you can check out her card for the Jingle Belles challenge HERE. 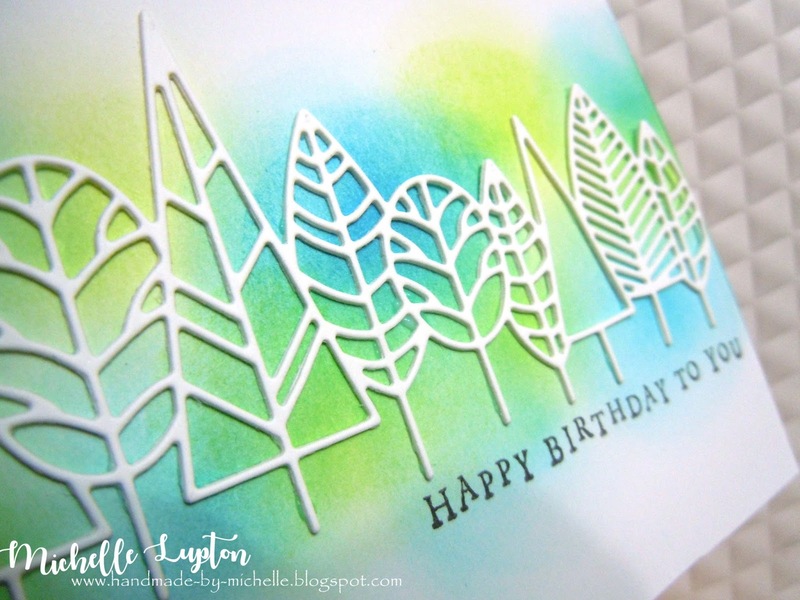 This card is a little bit outside my comfort zone - there are 6 layers! But that's what this series is all about - stretching my creative muscles! It's almost impossible to see the gold from the first photo, but check out the shine on the next photo. 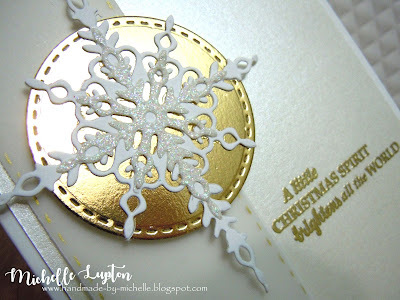 I used dies and stamps from Stampin' Up, along with a stitched circle die from Lil' Inkers. This is another card I had published in the latest Australian Cardmaking, Stamping and Papercraft magazine - this one was for the Colourful Christmas special feature. I used a stencil from Winnie and Walter along with a rainbow of Distress Oxide inks. I added a sentiment from Avery Elle, and die cut snowflakes from Simon Says Stamp. I used the Poppy Stamps Boddington Tree Border die, layered up over some Distress Ink blending in Twisted Citron and Mermaid Lagoon. If this looks vaguely familiar, it should! I used the same idea on a candle that I posted on my blog on Sunday! 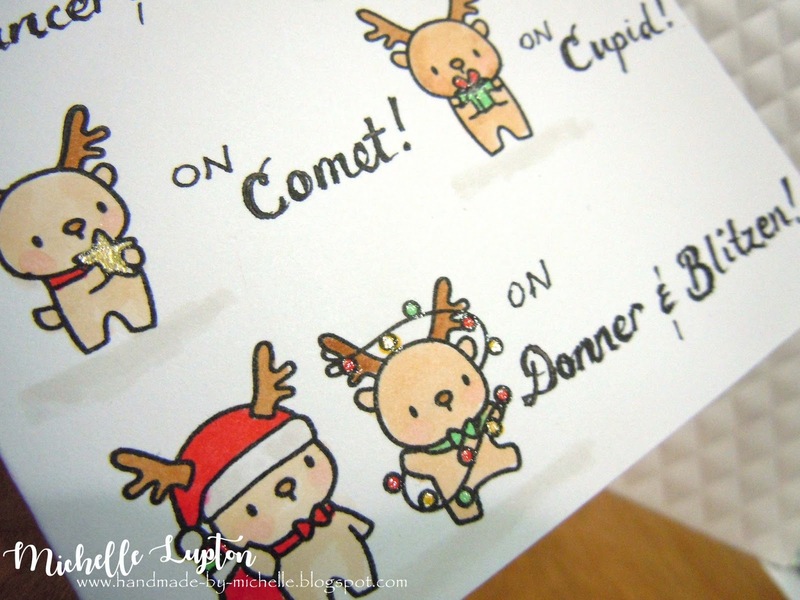 There's a prize up for grabs on that blog post - click HERE and leave a comment on my candle blog post to be in the running to win a voucher from Poppy Stamps! 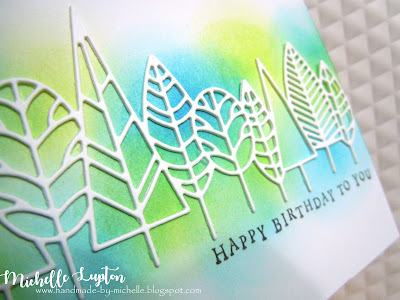 I recently had a bunch of cards published in the Australian Cardmaking, Stamping and Papercraft magazine - I will be sharing these in a few posts over the next week or so. These two cards were made as part of the stampers challenge, using the Mint Wishes stamp set from Kaiser Craft. 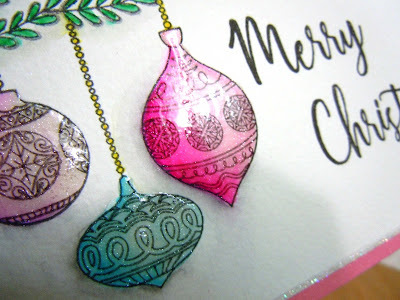 To add shine and dimension to the baubles, I coloured them to make them look round, then added a coat of Wink of Stella, then a coat of Glossy Accents, so they really look three-dimensional! 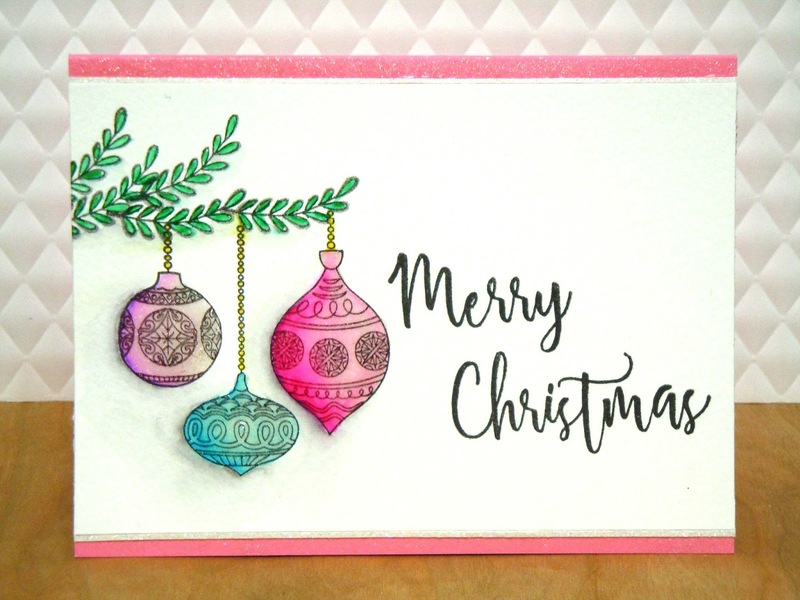 For the 2nd card, I used the stamps of leaves that the baubles are hanging from in the first card to create a Christmas tree, then added a bunch of enamel dots as baubles. 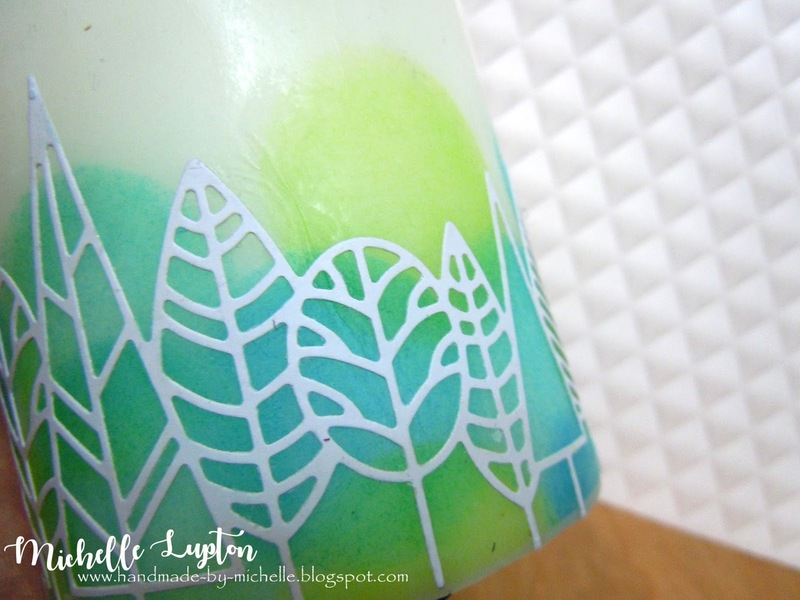 Today, the challenge theme is "Candles". 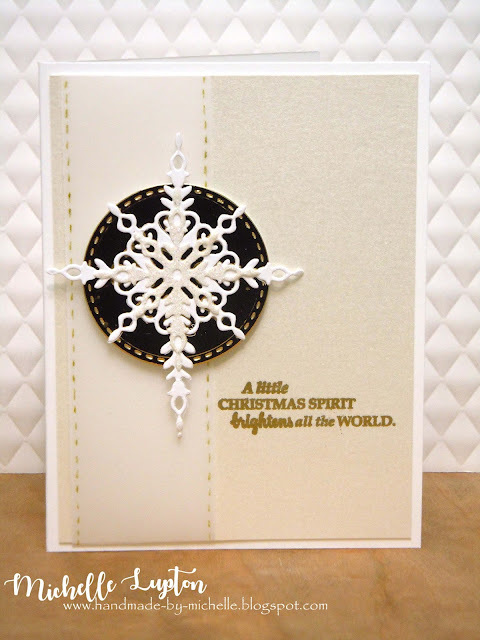 My special guest today is Jeanne Jachna - you can check out her take on this challenge HERE. 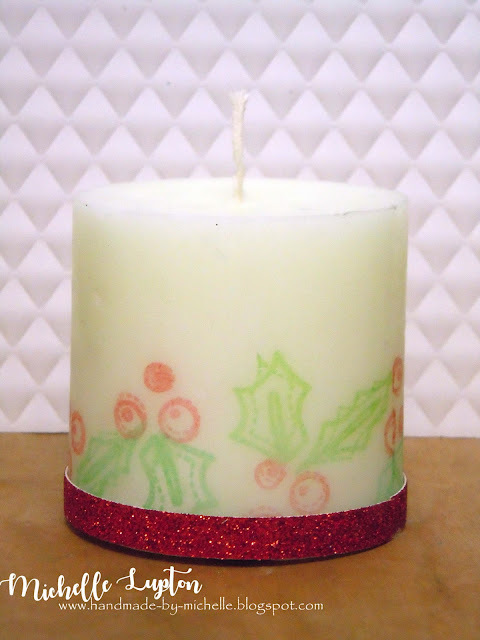 Here's my take - as you can see, I cheated a little bit - instead of adding candles to a Christmas card, I added Christmas decoration to a candle! And I made a video! A very important thing to add is that candles with this kind of decoration are not for burning, they are just for decoration! 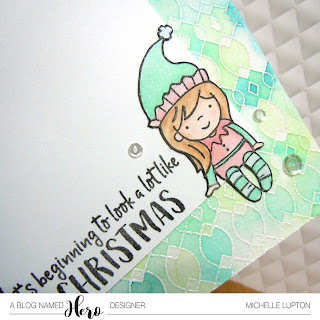 Now for an extra special surprise - Jeanne sent me a message a little while ago saying that Poppy Stamps has generously offered a prize - a $20 voucher! 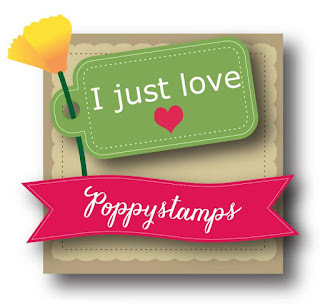 Poppy Stamps is a line of dies and clear stamps with companion dies from the creators of Memory Box. When Memory Box owners Monica and Dave Brethauer's children, Emma and Cooper got more involved in the family business, Poppy was created as an opportunity to teach them the business from the ground up. 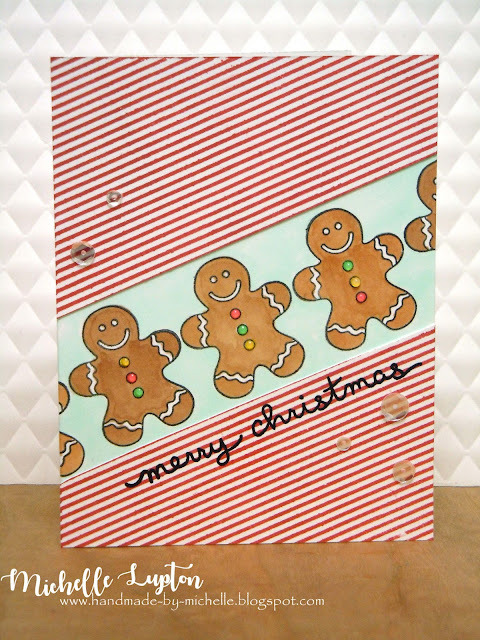 Dave created the images and designs with the kids, and made them responsible for filling orders, invoicing, and shipping - a true family business. The company has grown over the years and now has employees who handle the day to day operations. 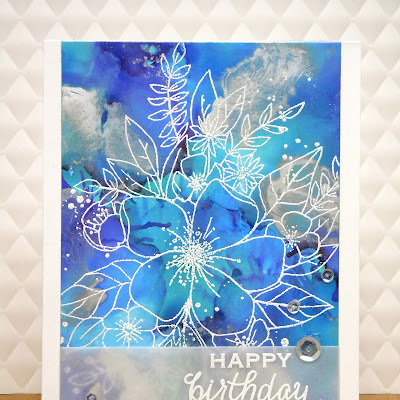 Poppy Stamps offers a large selection of intricate dies and backgrounds with the same quality you have come to expect from Memory Box with new releases several times a year. 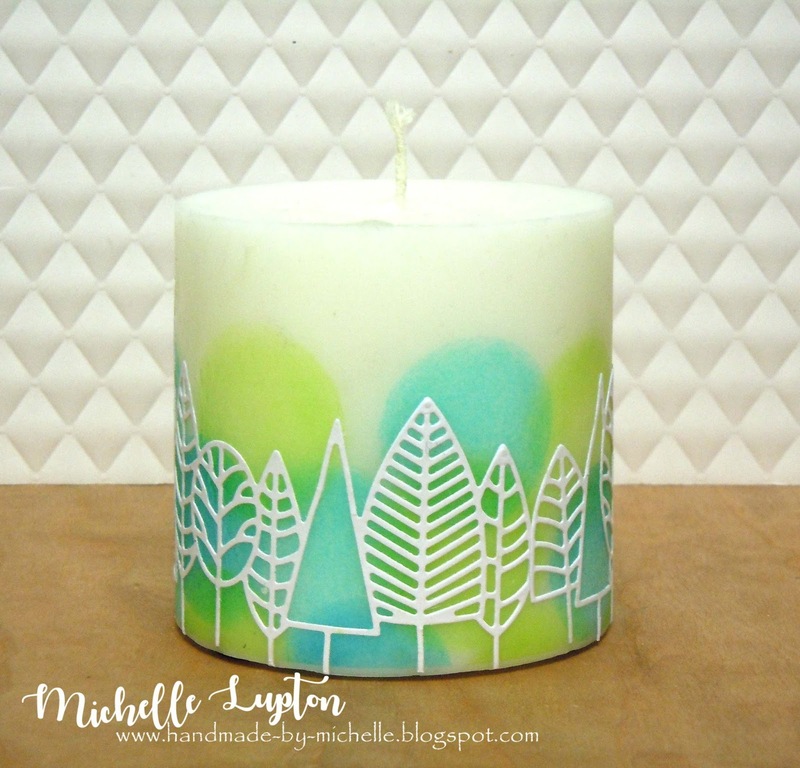 So, in honour of this special giveaway, I made another candle!! I used 2 ink blending tools to apply circles of colour to the tissue paper (because the paper is too fragile to actually blend ink onto it!) 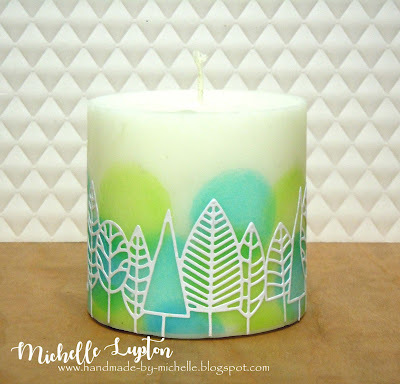 and then I added the paper to the candle in the same way as I showed in the video. 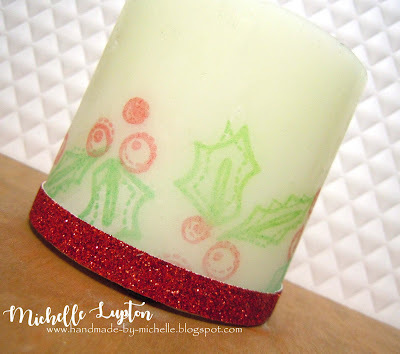 I then adhered the Poppy Stamps Boddington Tree Border die cut to the candle using Ranger Multi Medium Matt. All you need to do to be in with a chance of winning the voucher is leave a comment here by 5pm, Sunday, December 3rd AEDT, and I will choose a winner! Also, make sure you pop on over to the Poppy Stamps blog - they've got a prize up for grabs there soon too, so don't miss out on your chance! 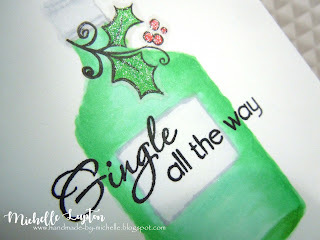 Today, the challenge theme came from my workmate, Lyn - the theme is "Gin". Unfortunately, today I don't have a guest, so I'm taking on this challenge solo! 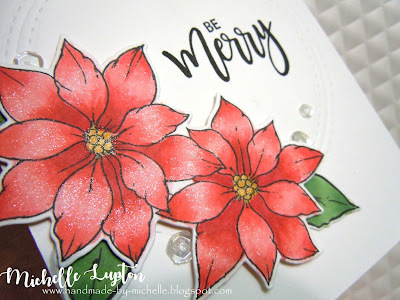 I did some judicious inking of two stamps from Paper Trey Ink "Communique Curves Vol 3", and added a sprig of holly from Annabelle Stamps (sadly, discontinued). 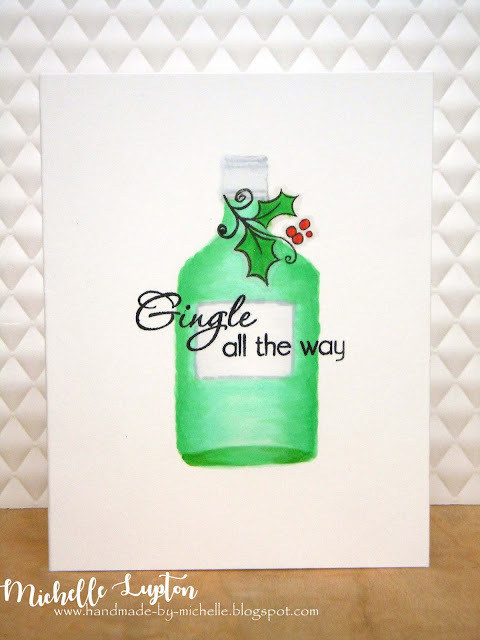 The bottle of gin is hand drawn. Hello, and welcome to a new challenge at Fusion! 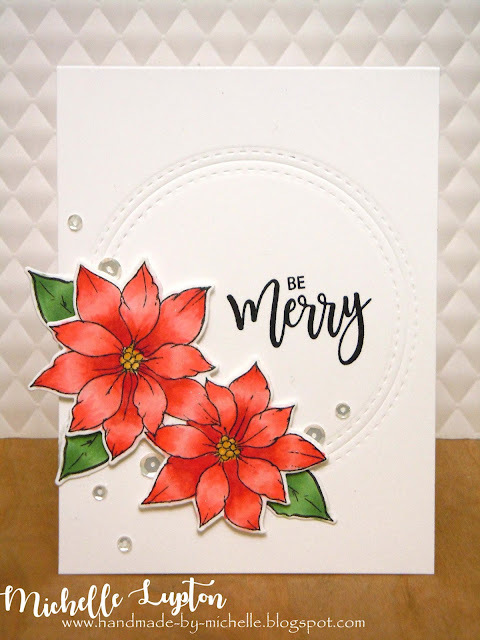 I used the Merry Poinsettia stamp set and matching dies from Studio Katia, along with a die from Lil Inkers Designs, and Copic markers. 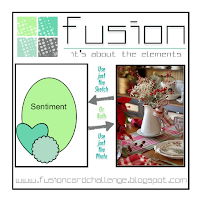 Make sure you check out the Fusion blog and join in on the fun! 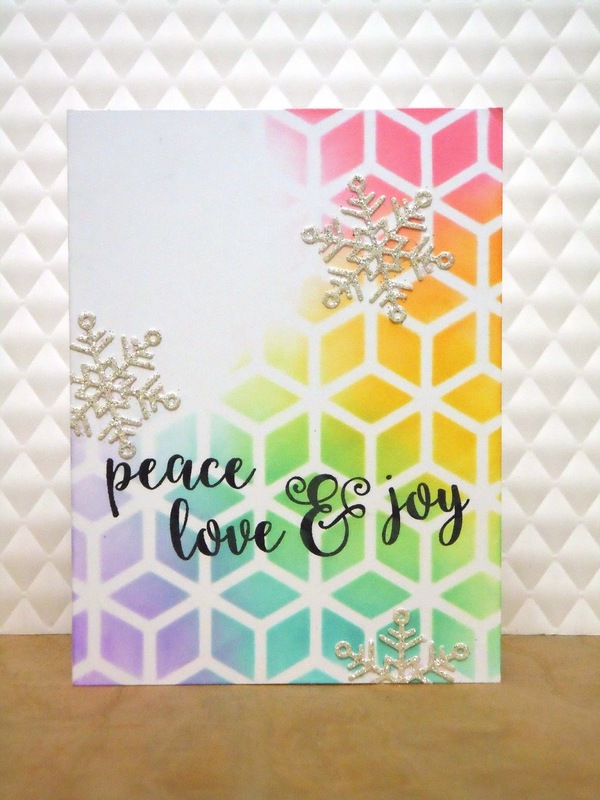 Today, the challenge theme is to use no red or green. My special guest today is Jane Clark - you can check out her take on this challenge HERE. And I made a video!! 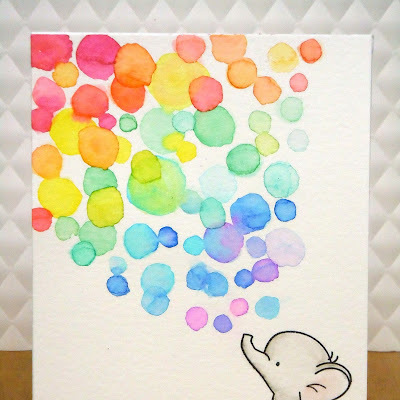 My special guest today is Deb McCleary - you can check out her take on this challenge below. I used a Simon Says Stamp die with embossing paste to create the snow in the background. 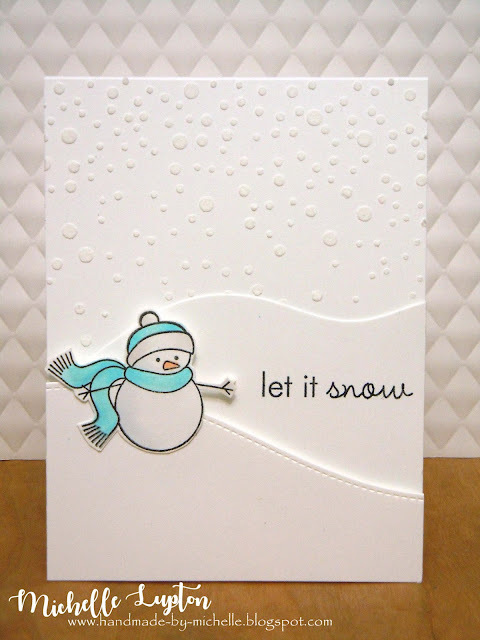 I created the snow drifts using Hillside Border dies from Lawn Fawn. 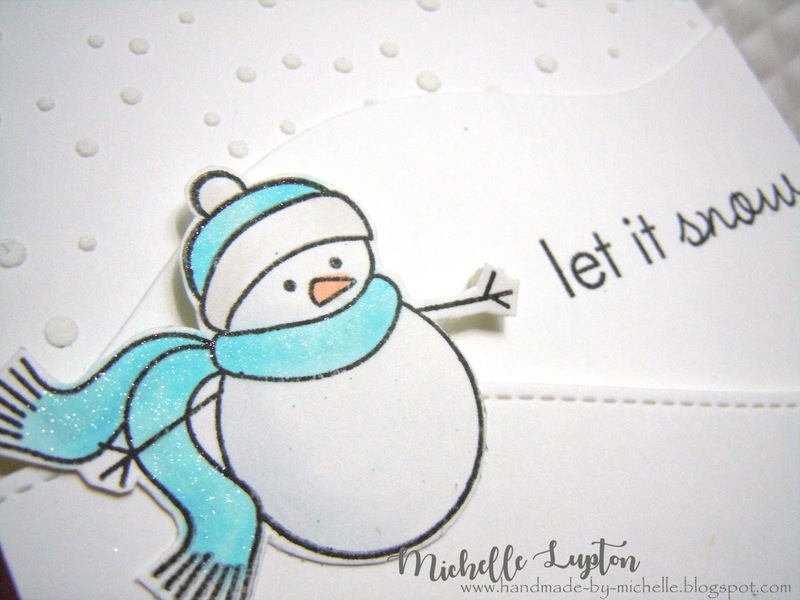 The snowman and the sentiment are from Papertrey Ink. 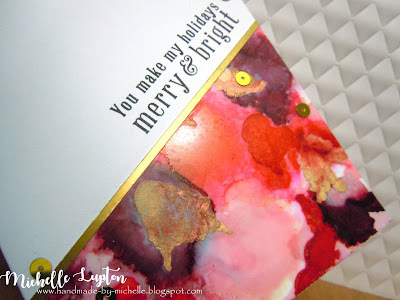 I love all the shine and texture on her card!! Gorgeous! 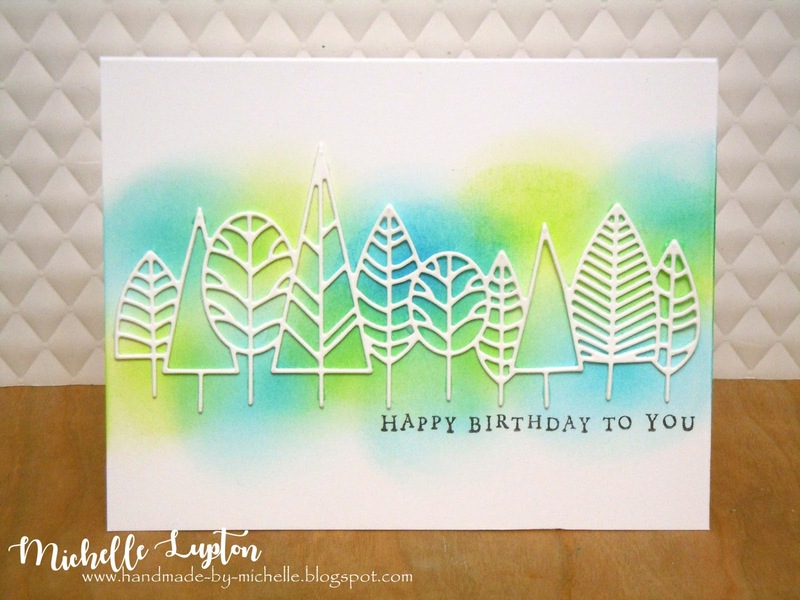 Today, the challenge theme is "Use a technique new to you". Unfortunately, today I don't have a guest, so I'm taking on this challenge solo! 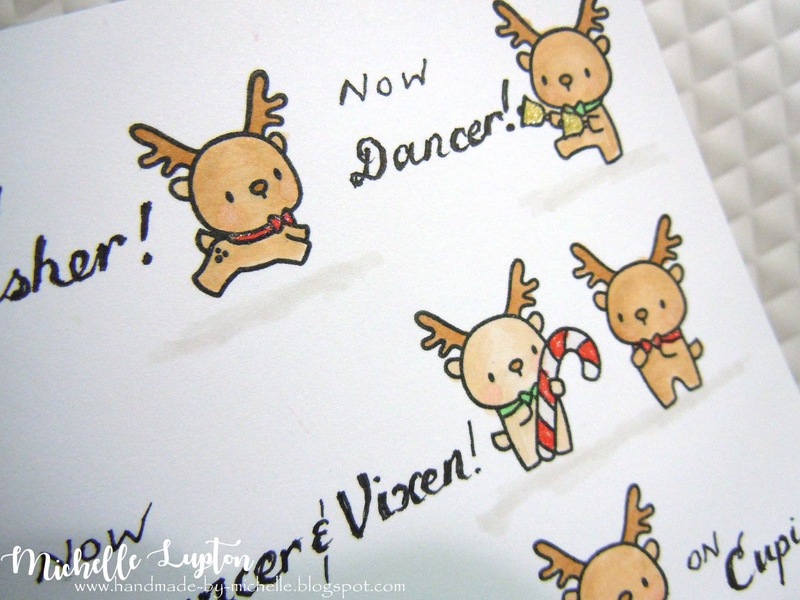 I made this card at the home of my choir conductor, Jan, who is also a crazy talented card maker. 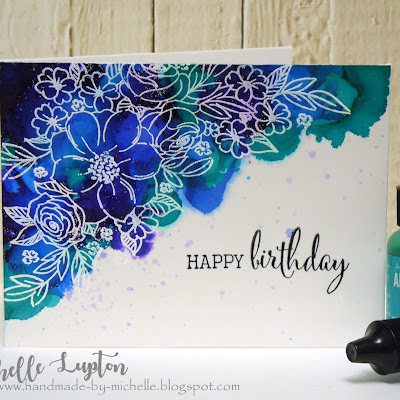 She taught me how to use Yupo and alcohol inks from Adirondack, and this was one of the results. 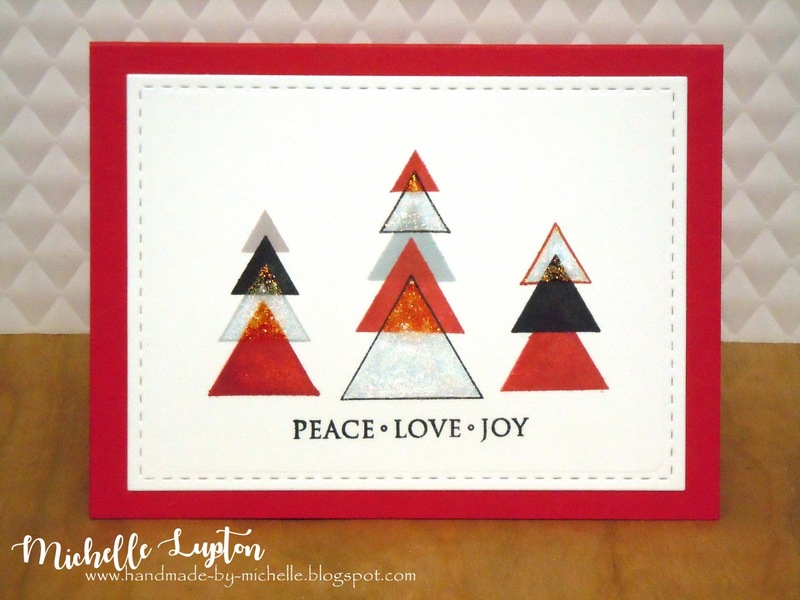 I cut my Yupo piece down and added it to a white card front with a strip of gold cardstock and a sentiment from Hero Arts. 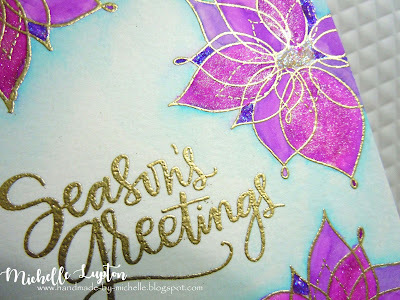 I added a scattering of gold sequins as a finishing touch. Today, the challenge theme is a photo inspiration. 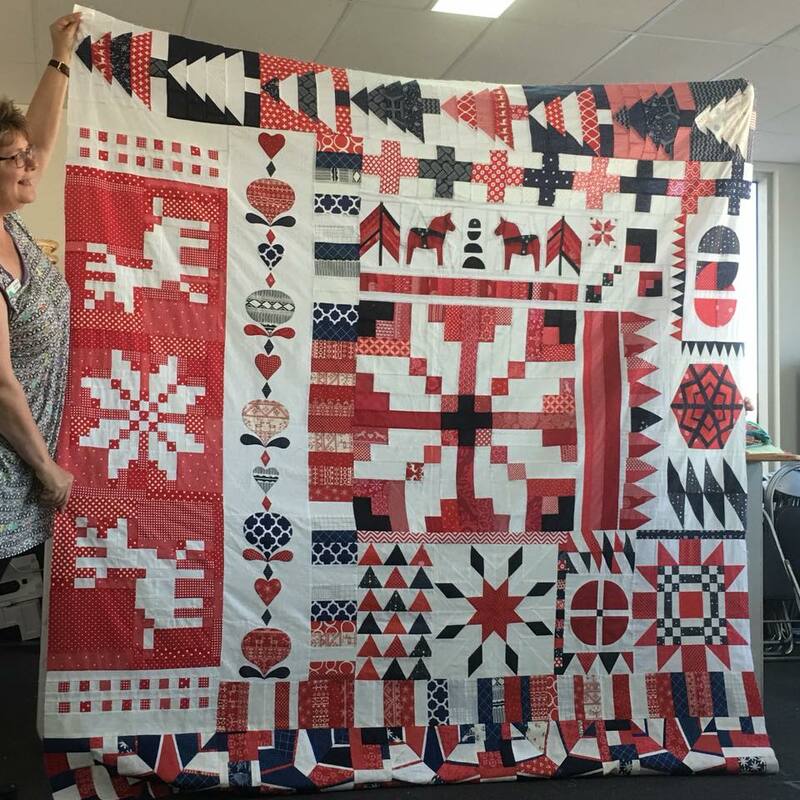 This quilt was made by Bronwyn Hooper and friends - it is a Melbourne Modern Quilt Guild (MMQG) Travelling Quilt "Nordic". 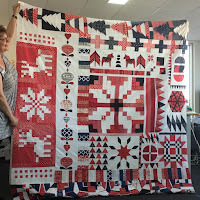 You can find out more about MMQG HERE, and more about this quilt and the Travelling Quilt Project HERE. My special guest today is Ardyth Percy Robb - you can check out her take on this challenge HERE. I was inspired by graphic cards by Ardyth, and also by geometric cards by Laura Bassen. 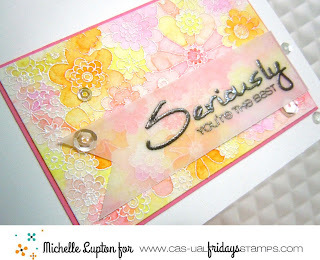 I used the Perfect Shapes stamp set from Simon Says Stamp, and the sentiment is from an old set by Hero Arts. 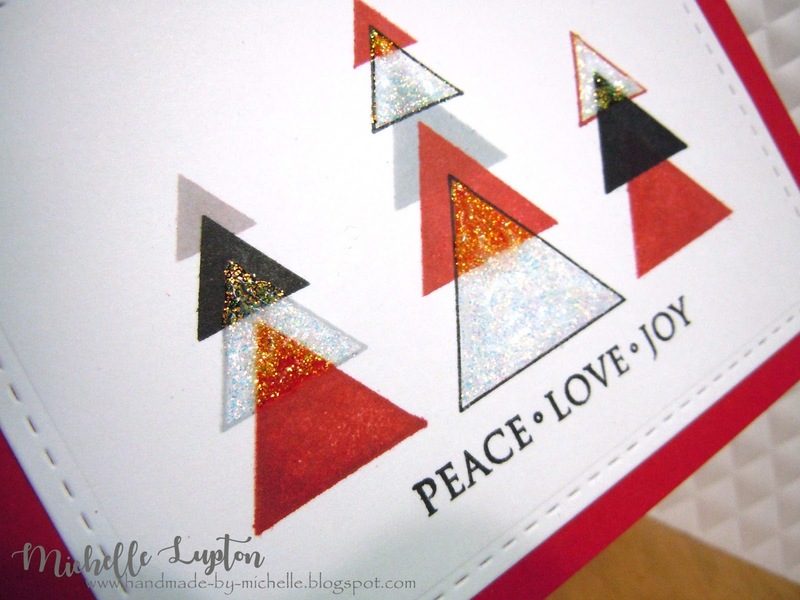 I used inks from Hero Arts, and finished with a coat of Diamond Stickles on the open triangles. 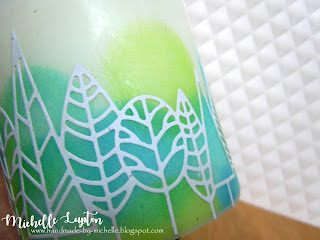 I love how the Stickles does different things on different colours of inks! 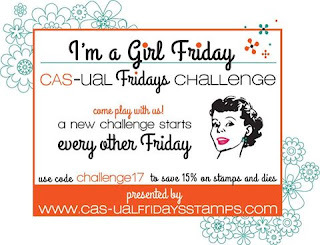 Welcome to a new challenge at CAS-ual Fridays Challenge! 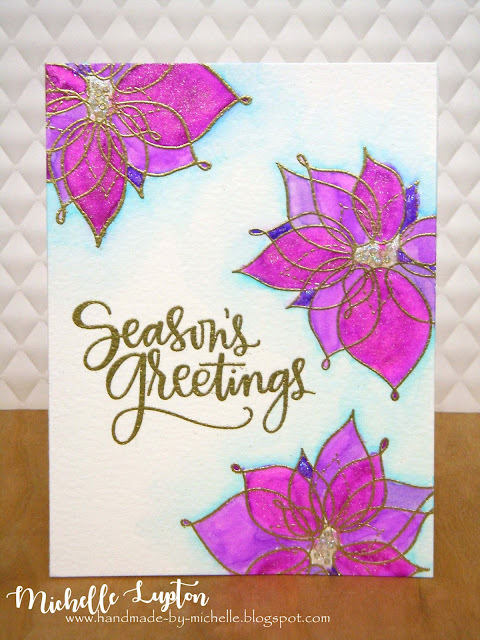 I used the Full on Floral background to create the patterned panel, colouring with Zig markers and water. 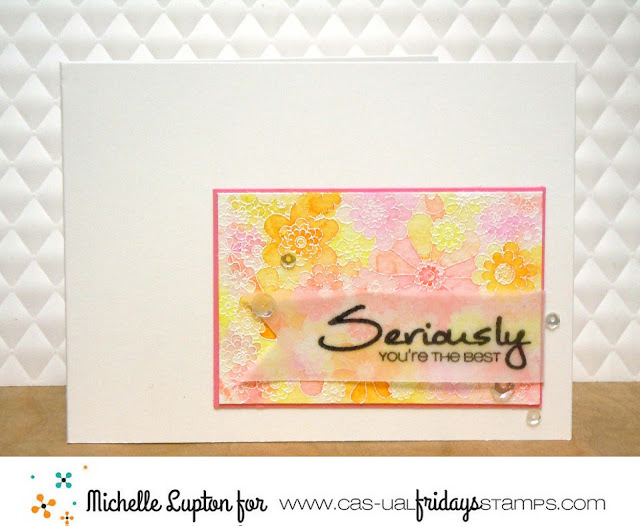 I cut it down and matted it onto some pink cardstock, before adding a sentiment from CAS-ual Fridays Mon Ami, stamped and embossed onto vellum. I finished with some sequins. 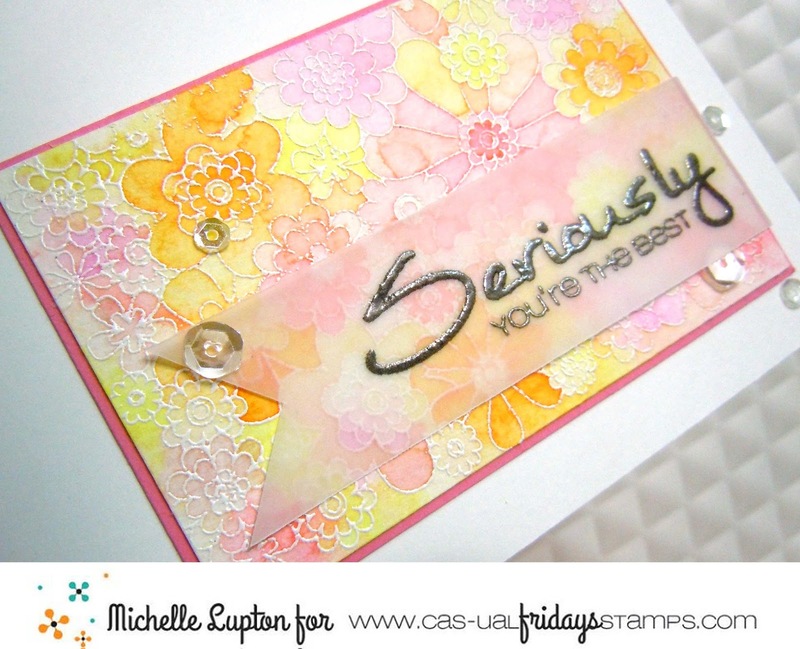 Make sure you visit the CAS-ual Fridays challenge blog to check out the rest of the design team's projects! 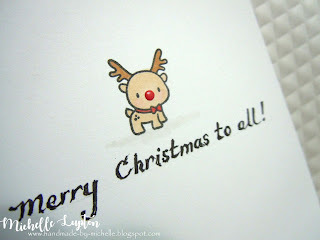 Today, the challenge theme is The Night Before Christmas. My special guest today is Therese Calvird - you can check out her take on this challenge HERE. 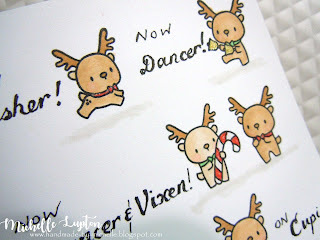 I stamped all of the reindeer, trying to match the image to their name just a bit, and then I hand-wrote the lines from the poem. 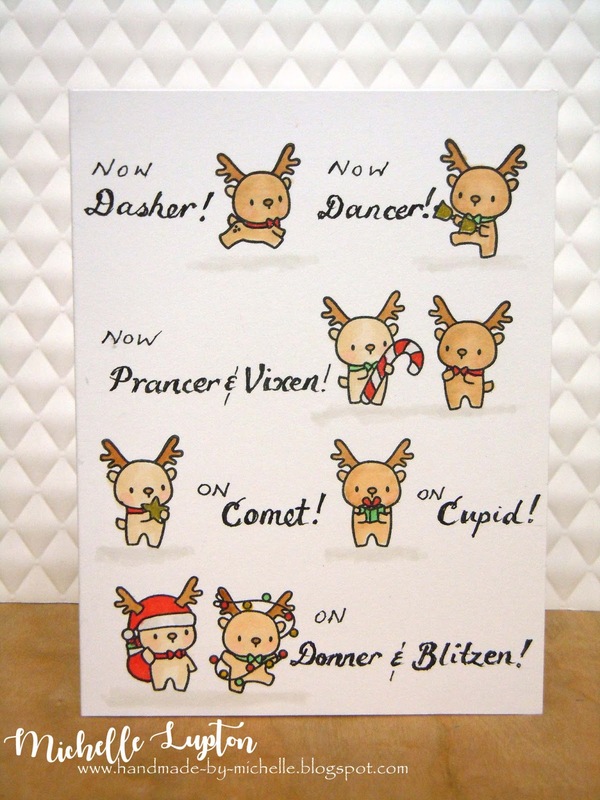 And then my Dad suggested that you can't have the 8 reindeer without the 9th, so I added Rudolph inside the card. I used the "Little reindeer agenda" stamp set from Mama Elephant - they're just so cute! 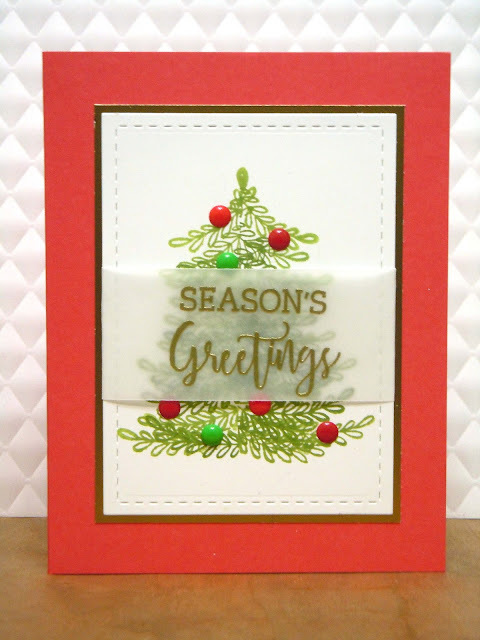 I actually made 2 cards for this challenge, but I decided that the first one I made was too similar to a card I made a few years ago (it had a mouse in a Christmas stocking, and the sentiment "Not a creature was stirring".) 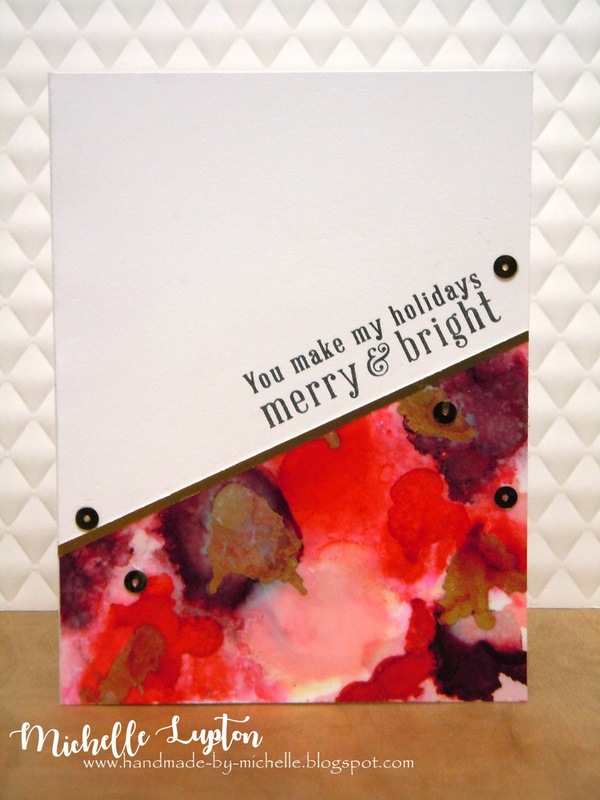 I'm glad I decided to make a new card - this one is much more fun! Today, the challenge theme is Edible. My special guest today is Betty Keefe - you can check out her take on this challenge HERE. Here's my take - the card is not edible, but the subject of the card is! 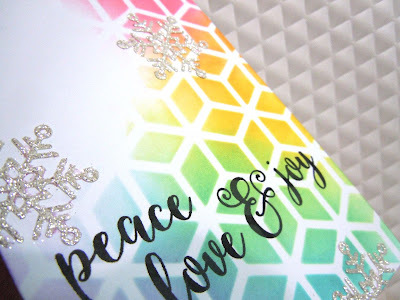 It's a STAMPtember blog party! Any products that I mention in this blog are products that I use and like. Affiliate links are sometimes used, at no cost to you. However, I won't use something I don't like!